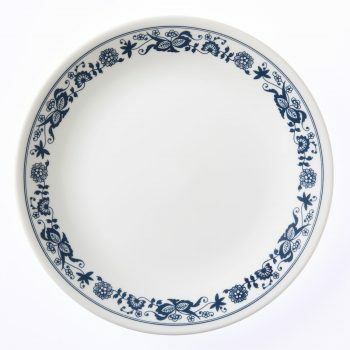 If your dishes are looking a little worse-for-wear, you might be sorely tempted to go out and buy a new set. 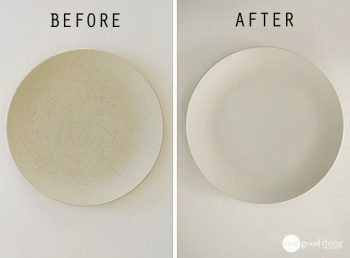 But if they’re still functional or hold sentimental value (I am using the old Corelle I grew up eating from), there’s a simple way to get rid of those gray-hued scratches and bring new life to your old dishes. You might have everything you need sitting under your kitchen sink, but even if you don’t, run to your local Walmart or supermarket and pick up a bottle of Bar Keeper’s Friend. This stuff has been around since 1882, and is derived from rhubarb, of all things! It was first sold to local taverns to shine up their kitchen tools, and it can do the same for yours. This will be all you need, except a sponge or rag, and a pair of gloves if that’s how you roll. 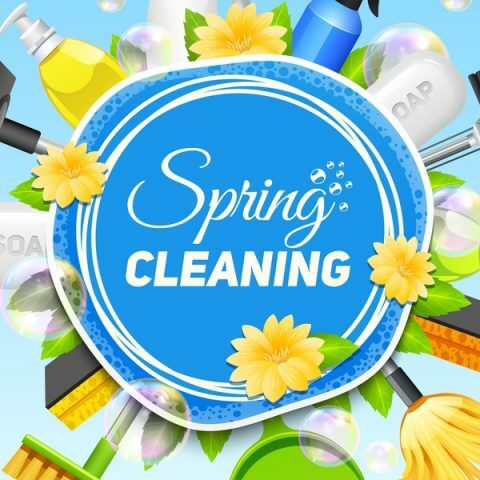 Grab your sponge (use the scrubby side if there is one) and dampen it. It doesn’t have to be soaking wet to activate this cleanser. 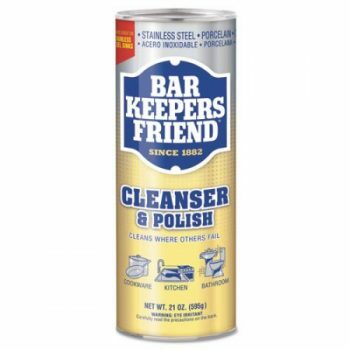 Sprinkle on your Bar Keeper’s Friend and give your dishes a scrub. Give it some gentle pressure, but don’t scrub too hard or you could compromise the shiny finish. Rinse your dishes well, or run them through the dishwasher if you feel the need to be extra thorough in removing any trace of the cleanser. Now just enjoy your clean, shiny, scratch-free dishes. 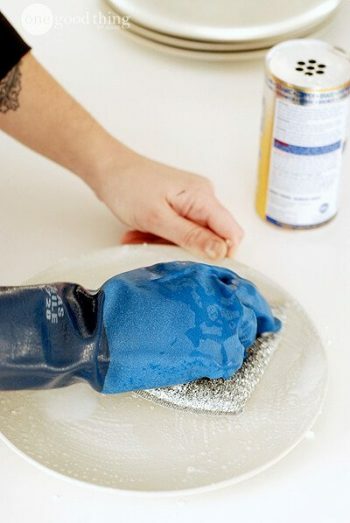 Whether you’re hosting a party or just want to liven them up, this trick will save your dishes AND your money.